The Haida of the Queen Charlotte Islands (Haida Gwaii-SEE MAP) have fascinated all who have visited them, from the first travelers and explorers of the late eighteenth century to the anthropologists of the present. To early visitors the Haida presented a culture, complex in social organization and rich in artistic expression, which displayed a fine and fulfilling balance between man and the natural and supernatural worlds. With continued exposure to the pressures, both spiritual and material, of European culture this balance was disrupted, and the traditional Haida way of life came close to extinction. Today, however, the Haida regard their future with hope, bolstered by recent developments that hold great potential for reinforcing their cultural revival. Haida Gwaii is an archipelago of islands (the Queen Charlotte Islands-SEE MAP) off the northern coast of British Columbia near the province's border with Alaska. The southern islands are mountainous, with Moresby Island predominating. The large northern island, Graham Island, where the Haida people now live, is mountainous on its western side but to the east is flat with isolated outcrops of rock. North of Dixon Entrance are the Kaigani Haida, as the Haida in Alaska are named. Their territory encompasses the southern half of Prince of Wales Island in Alaska. During the end of the last ice age between 13,000 and 11,000 years ago, events resulted in very low water levels around Haida Gwaii. What is now Hecate Strait, the body of water that separates Haida Gwaii from the mainland, was for the most part dry land. Throughout this area of dry land, there were lakes and small rivers draining north and south to the Pacific Ocean. Soil samples from Hecate Strait indicate that many areas were habitable in the last ice age. After 10,000 years ago, the melting glaciers contributed to a rise in the sea level that resulted in a flooding of the Northwest Coast, temporarily creating beach lines high above today's high tide marks. The memory of this drastic fluctuation of sea levels is preserved in the widespread flood myths of people along the Northwest Coast. Scores of these stories have been recorded. According to Haida tradition, there was a remnant of an earlier population on the west coast of Haida Gwaii. Marius Barbeau of the Canadian Museum of Civilization collected a flood legend from Henry Young of Skidegate in 1947. 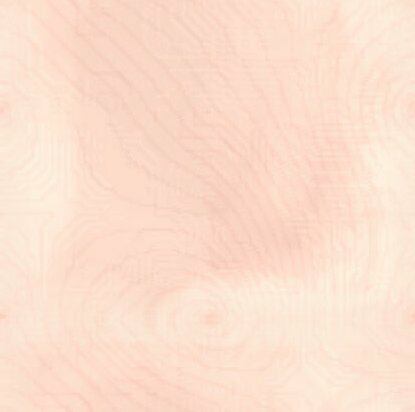 Intensive review of the body of flood and related myths of the Haida is likely to prove that they have inhabited Haida Gwaii since the end of the last ice age and thus constitute one of the oldest traceable populations of any in the New World. Archaeological surveys have located sites in all parts of Haida Gwaii that indicate the population was sizable by 5,000 years ago. At about that time, their economy was expanding from a primary reliance on hunting and fishing to include harvesting shellfish from the huge inner tidal areas that surround many of the more protected waterways of the islands. The abundance of shellfish provided a virtually inexhaustible supply of food; it also made possible a stability of residence that allowed the establishment of more permanent villages where food, tools and other material objects could be safely stored, as well as the development of craftsmen who could devote more time to art. These changes led to the refinement of woodworking tools and skills, which, in turn, allowed for the construction of bigger and more elaborate canoes as well as larger plank houses. Improved watercraft also meant that people were able to travel to food resources in far-flung areas and that warfare, particularly against mainland tribes, was a profitable venture. In fact, at the time of first contact with Europeans, the Haida could strike out from their island fortress and cross the treacherous waters of Hecate Strait, which they alone had mastered, with little fear of retribution from their mainland enemies. CCTHITA (Central Council of the Tlingit and Haida Indian Tribes of Alaska) is the Tribal Government representing over 24,000 Tlingit and Haida Indians worldwide. We are a sovereign entity and have a government to government relationship with the United States. The Council's headquarters is in Juneau, Alaska but our commitment to serving the Tlingit and Haida people extends throughout the United States. When we are alone we are weak but together we are strong. You can make a difference. Join hands with us as we seek a better day for Tlingits, Haidas, and all indigenous people. 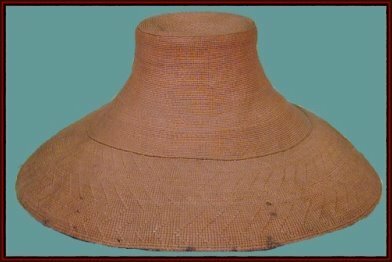 Twined spruce root hats from Alaska and British Columbia feature beautifully flaring rims and elaborate woven patterns. Painted crest designs often adorn the finished hat. Haida weavers are acknowledged experts in this style, and Haida hats traditionally have been traded to neighboring groups. 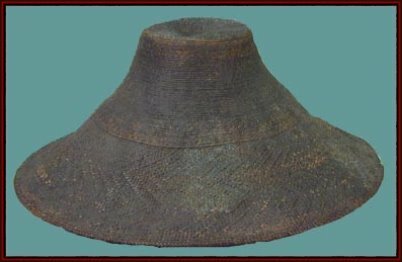 Often, museums identify hats according to the tribe from which they were collected. 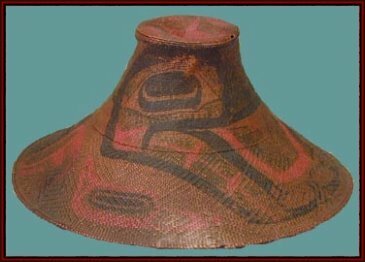 Research is showing that neighbors of the Haida bought Haida-woven unpainted hats and painted them with designs typical of their own tribes. TWINED SPRUCE ROOT HAT Haida-style weaving:The vertical zigzag pattern on the brim of this hat is called "snail's tracks." 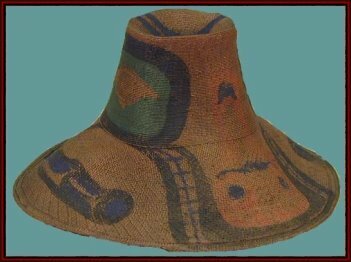 The "jogs" on this hat are very subtle, with no abrupt jumps between rows, making it likely that this was woven by a very experienced and careful weaver. by Kwakwaka'wakw women, inspired by Haida models. If so, it may be difficult to confirm this. 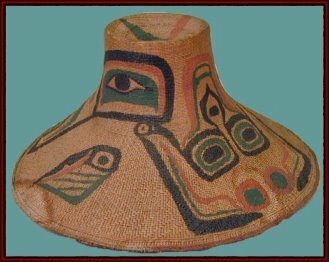 TWINED SPRUCE ROOT HAT Haida-style weaving;Kwakwaka'wakw-style painting: A standard design on painted hats is an abstract animal with a snout on the brim, eyes on the crown, and a tail opposite the snout. Fins or wings are located on the brim between the snout and tail. 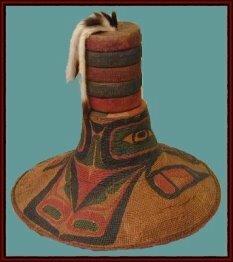 from the Tlingit : Though collected from the Tlingit, this hat shows a jog up to the right where the weaver changes pattern, a Haida weaver's characteristic. Tlingit weavers held their baskets in the opposite direction, so their hats have a jog down to the right. Like many hats, this one has black fabric ties stitched to the headband underneath to hold the hat on the head. The edge of this hat is finished in the same technique that Isabella Edenshaw often used - a four-strand, two-ridge flat braid. However, the raised row above the braid is unlike her style, and no other details in this hat match the techniques used by Edenshaw. 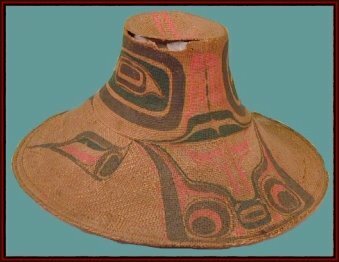 from the Tlingit: The painting on this hat shows the Haida form line style with connected bands of red and black, unlike the Kwakwaka'wakw style that has disconnected design elements. 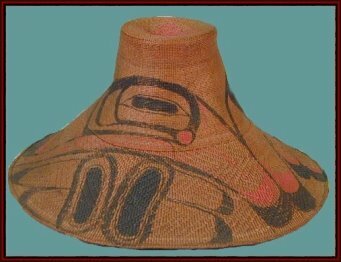 TWINED SPRUCE ROOT HAT Haida-style weaving: painted blue-green, it appears that this hat was painted blue-green only. 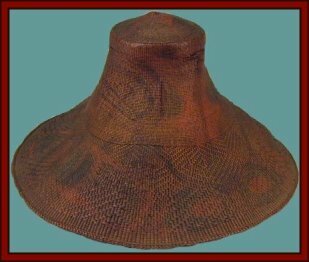 Many Haida-style hats in museum collections have this finish, which may have been applied as rain proofing. that parts of two separate hats have been joined together, the basketry rings and the crown of the hat (at the top) have been joined to the flaring sides. Tlingit at Fort Tongass, 1899: Although, the brim on this hat has the mamatsiki diamond design much like that on the Isabella Edenshaw hat, these are not attributed to her. The raised row of S-twining between the crown and brim, along with the complex braid at the hat's edge, are not indicative of Edenshaw's style. Thus ends our all too brief visit with the Haida Peoples. I encourage all that seek to know more about other Native American Brothers and Sisters to visit the links provided within this article, and thus begin a new search of your own to discover more treasures hidden within the simple yet complex term: Native American.